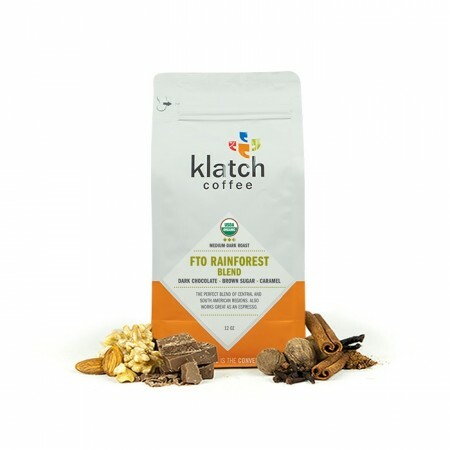 This is the FTO Rainforest Blend brought to you by Klatch Coffee. Fair Trade and Organic certified coffees from Brazil, Colombia, Honduras, Guatemala were carefully chosen and blended together to create the Rainforest Blend. A perfect example of a smooth Central and South American profile, this blend offers sweet, smooth and full bodied notes of dark chocolate, brown sugar and caramel. Very smooth, prominent chocolate, full bodied, with notes of brown sugar and caramel. It is a bit sweeter than my "optimal" coffee, but I still like it a lot. It doesn't seem like something that would grow old on me, but would be a nice variety among other coffees. Great taste. A little stronger than last month which I liked. Brewed this in my cold brew pitcher. Very smooth, very full bodied, and you can taste the caramel and chocolate flavorings. Great heated up and iced. Superb. Bold but not over roasted. There’s a nice sweetness to compliment the earthy chocolate tones. I brewed in a pourover and got nice consistent results every time. A delicious foolproof coffee. The flavor is a little lighter than I prefer, I wish it were a little bolder/stronger.